Add some style to your weekend cook-out! Whether you're grilling hamburgers or preparing a five course meal, you'll be able to take on the mess. But, even more impressive, Saint James offers a specially designed garment, to protect your body against the harmful solar rays. This polyamid microfiber offers a skin protection twice as much superior to Cotton. You will also appreciate its easy care, drying and active breathing properties. 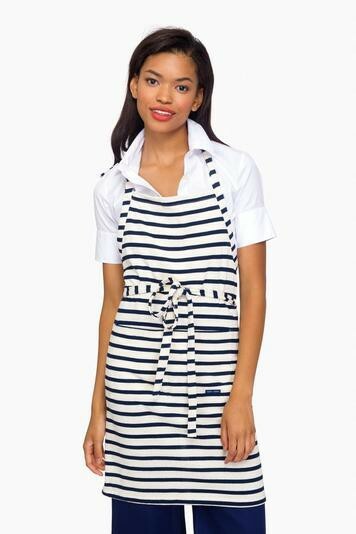 I bought this to wear at our lake house, it's perfect, nothing screams summer by the water better than navy and white stripes. It's a great apron, fits well, and has a well positioned pocket at the front. I look forward to many years of use. This knit apron is large, so it will fit almost everyone. It has handy pockets in front and is nice and soft. I recommend it!